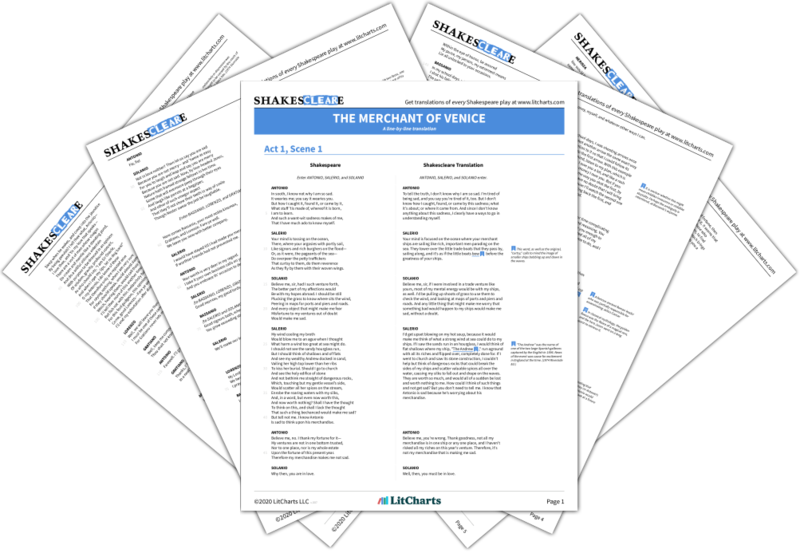 Instant downloads of all 942 LitChart PDFs (including The Merchant of Venice). New! 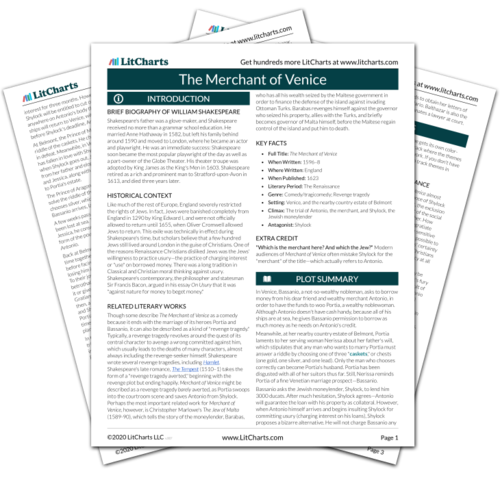 Understand every line of The Merchant of Venice. LitCharts assigns a color and icon to each theme in The Merchant of Venice, which you can use to track the themes throughout the work. At Belmont, the Prince of Morocco has arrived to seek Portia's hand in marriage. He begs her not to dislike him just because of his dark skin, and points out that his blood is just as red as that of the "fairest" European. He adds that he has proven himself brave and won the love of many of the most desirable virgins in his native country, and would only ever wish to change his appearance in order to please Portia. Anticipating the prejudices that Portia and the other Christian Venetians hold, Morocco's talk of skin color and red blood reduces human beings to meat, recalling the pound of flesh Shylock wants from Antonio. At the same time, Morocco's words establish a basis for equality among all people. Portia reminds Morocco that what she wants is irrelevant. The riddle of the caskets, devised by her father, has deprived her of the right to choose her husband. Besides, she adds, if she did have any say in things, she would hold Morocco in just as high esteem as any other suitor who has come for her thus far. Based on Portia's mocking of all of Nerissa's other suitors in 1.2, her seeming compliment to Morocco is actually a sarcastic quip. Yet Morocco can't know this, showing that interpretation is a matter of context. Morocco rejoices, and asks Portia to bring him to the caskets so he might try his fortune. Portia reminds him that he must abide by even the harshest rule governing the riddle: if he chooses incorrectly, he must "never speak to lady afterward/ in way of marriage" (2.2.41-2). Morocco assures her that he understands and will obey this harsh rule. The two proceed to dinner. Portia's explanation of the terms of her father's riddle shows the strict legal structure of the riddle. By cutting off the scene here, before Morocco chooses a casket, Shakespeare makes Morocco's eventual reading and interpretation of the riddle much more dramatic and suspenseful. Morocco, unlike the other suitors, proves his valiance in his willingness to risk so much for Portia's love. Weigel, Moira. "The Merchant of Venice Act 2, scene 1." LitCharts. LitCharts LLC, 22 Jul 2013. Web. 28 Nov 2018. Weigel, Moira. "The Merchant of Venice Act 2, scene 1." LitCharts LLC, July 22, 2013. Retrieved November 28, 2018. https://www.litcharts.com/lit/the-merchant-of-venice/act-2-scene-1.